The Tinley Park Bobcats of Northern Illinois now have an expansion league in Addis Ababa. 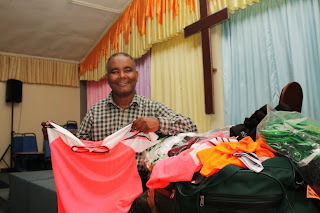 Pastor Girum Molla of the Gofa Christian Brethren (Wondimamach) Church, gladly took delivery of 130 soccer jerseys, 100 pairs of soccer socks and around 80 pairs of shorts. The children in their soccer outreach program will now have spiffy new uniforms with a Chicago flair.